Two Korean fashion designers presented their menswear collection at Pier 59 Studios in New York on Monday, the first day of New York Fashion Week: Men’s. Kang Dong-jun of DBYD and Jang Hyung-chul of Ordinary People were presented by Concept Korea, a project promoting Korean culture sponsored by the Ministry of Culture, Sports and Tourism and the Korea Creative Content Agency. Kang presented a collection that employed modern silhouettes in trench coats and patterned long cardigans, reflecting the ideas of “ownership and existence,” the theme of the film “Her” (2013). Ordinary People’s Jang chose hotels as his motif, creating outfits inspired by events hosted at hotels using animal patterns and colors like camel and yellow ochre. 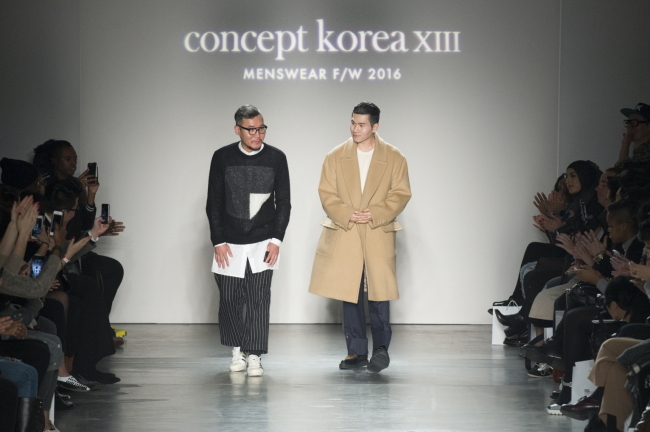 This was the 13th fashion show presented by Concept Korea since the project was launched in 2010. Concept Korea will be presenting womenswear collections by Lee Ji-yeon of JARRET and Kim Tae-keun of YOHANIX on Feb. 12 at The Dock, Skylight at Moynihan Station during New York Fashion Week. This will be Kim’s first time participating in the Concept Korea project, while the other three designers presented their work for the spring-summer 2016 collection last season.